Karpathos island is located between the two well know Greek islands of Rhodes and Crete, with a history dating back to the Minoan era and Mycenaean tombs and settlements going back to the second millennium B.C. In the Doric times (1000 BC) it was referred to as Tetrapolis, after the four famous cities, Potideo (Pigadia), Arkessia (the present Arkasa), Vrykous and Nissyros (in the area of Olympos). In the Classic and Hellenistic periods followed the history of the rest of Greece. In 42 BC Karpathos was conquered by the Romans and later became part of the Byzantine Empire. From the 7th to 10th century A.D. Karpathos was ravaged by the pirates. The people who lived close to the sea moved to the mountains. The island was invaded by the Genoans, St. John's Knights, the Venetians and the Turks. In the 1821 revolution Karpathos was liberated and in 1830 was given back to the Turks under a treaty. In 1912 the island was conquered by the Italians and in 1948 it was liberated and joined the rest of Greece. As a result of the Italian occupation, the Italian influence is very prominent throughout the southern islands of Greece including Karpathos. Italian tourists frequently quote "Karpathos is what Venice would be if it were surrounded by deep blue oceans". Many of the elder locals speak fluently Italian and much of the architecture of the early 1900's is very influenced by Italians. During World War I & II many Karpathian immigrated to all over the world. Very many went to the United States, working primarily in the food and bar industries. 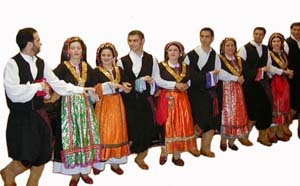 The close knit family life of the Karpathian community allowed for much of the fortunes accumulated in the States to be sent over to Karpathos. Almost everyone you talk to on the streets has or had a relative immigrant in the United States as well as Australia, Belgium, Germany, France, England, Africa, and every other corner of the globe. Foreign money, especially the U.S. dollar, is very prominent around the island. In fact the island of Karpathos is one of the richest per capita than any other island in Greece, mostly due to foreign money. Attending any local festival such as a dance or wedding, you will you be amazed at the amount of traditional gold jewelry complimenting the old-world outfits. The gold decorations around the females necks are 24 kt gold coins in bezel. A very wealthy area indeed..